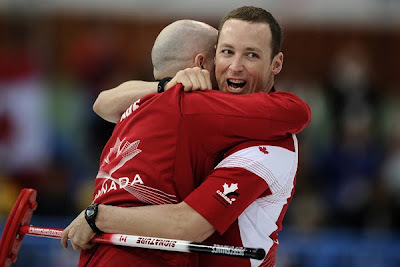 Earlier today (April 11) Edmonton curler Kevin Koe and his teammates Nolan Thiessen (pictured left with Koe), Blake MacDonald and Carter Rycroft won the 2010 Capital One Men's World Curling Championship in Cortina d'Ampezzo, Italy. Like fellow Edmontonian Kevin Martin did at the Olympics in February, Koe shut-out runners-up Norway. "It's been an amazing run," Koe said after his win, Canada's 32nd overall. "It's hard to believe that it's over and that we're world champions. It just feels great. 32-year-old mechanical engineer and "computer nerd" Christian Nelson is recruiting volunteers to help him piece together our city...in 3-D! "You have to be either a photo geek or a computer geek," he told the Edmonton Journal. "For the pictures, basically anyone with a digital camera can help out." The purpose of the project is to landscape Edmonton in 3-D form for Google Earth's 3-D model option, and will next tackle the University of Alberta campus. Nelson has already captured over 200 downtown & Oliver buildings for the site. "Top 40 Under 40" alumni Cary Williams and Mack D. Male were both recently invited to attend Thursday's "ONEdmonton Leaders Forum," which is intended to "bring together the region's most influential leaders to discuss key topics affecting our community." You can read Male's recap of the forum here. Speaking of "40 Under 40," Avenue Edmonton magazine is looking for its next faces for their second annual "Top 40 Under 40" issue, which celebrates Edmontonians who excel in their careers, and whom are passionate about making the city a better place to live. Visit this link to nominate someone who is under the age of 40. The issue will hit streets in November. "All the world's a stage and all the men and women merely players," reads the tagline for As You Like It, James MacDonald's take on the 400-year-old Shakespeare play. The stage show follows Rosalind, who is banished from her own uncle's court, and has to disguise herself as a boy, only to fall in love with a young man named Orlando. Featuring participants of the 2010 Citadel/Banff Centre Profession Theatre Program, As You Like It runs at the Maclab Theatre (Citadel Theatre) from April 17 to May 9. 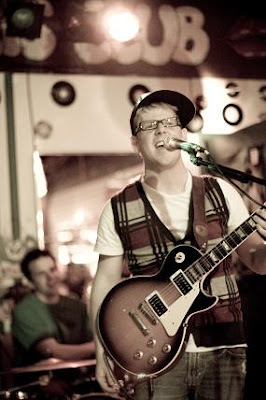 Earlier this month (April 3) I had the privilege of checking out a low-key live double-bill at downtown watering hole The Hydeaway (10209-100 Ave.), featuring local musicians Darryl Matthews (see video below) and the Ray Mailman Band. The former's acoustic set was worth the $9 I paid to get in alone, and Mailman's turn at the modest stage only amplified the casual night out. Mailman (pictured right) signed the copy of his 7-song EP Sideways I bought in between sets. The record has made itself right at home in my car stereo! You can pick up the CD for yourself at cdbaby.com. Conan O'Brien's visit to The Venue at the River Cree Casino (April 17) may be sold out, but there are plenty of other upcoming outtings at the Enoch Reserve complex. After the MMA Fighting Tournament wraps up on April 23, The Venue will host the "Whose Live Anyway?" improv show on the 24th, and then comedian Don Rickles (April 28), country singer Randy Travis (May 1), The Duchess of York Sarah Ferguson (May 8), rock band Creedence Clearwater Revisited (May 22), the Vietnamese concert "Paris By Night" (May 23), TV legend Bob Newhart (May 28), movie star Tim Allen (June 19), and '60s & '70s pop star Frankie Valli (with The Four Seasons) (June 26). Tickets for all of these shows are available at Ticketmaster. It may not seem all that interesting at first glance, but south Edmonton is now home to a brand new $99-million, state-of-the-art ETS garage that is equivalent to the size of five football fields (2.8 hectares). The environmentally friendly Centennial Garage, located at 15520 Ellerslie Road, is the first new Edmonton Transit System facility in 25 years. The giant steel & concrete structure can house up to 250 of Edmonton's 950 buses, and will officially open on April 24. DVD Pick: George Clooney's Up in the Air (2009) had only recently been removed from Edmonton's only "dollar theatre," Movies 12, so I took to the sofa to check out the Jason Reitman film instead. In short, the 109-minute feature tells the story of Ryan Bingham (Clooney), who travels the U.S. firing people for large corporations, but comes across a pair of kinships that has him questioning his own purpose in this life. Up in the Air warranted the hype of six Oscar nods (including Best Picture & Actor) and earned more than $160 million at the box office. 4/5 stars. Below is a video of Edmonton-based musician Darryl Matthews, who recently played an acoustic set at The Hydeaway pub in downtown Edmonton. The song is an instrumental titled "The Forgotten" (2009), and is courtesy of YouTube.